There are events that take place throughout the history of the world that are so massive that they are ingrained in our heads from the moment that we hear of them. The places in which those events took place become a tourist spot for many people to visit but at one point they were the site of disaster. One such place is Yellowstone Park. The site where many people in the US visit every year as one of the national parks in the country is also the site of the Yellowstone Volcano. This is what is called a supervolcano which means that its eruptions have been categorized as a VEI8 (volcano eruption index). There are three calderas in the Yellowstone Plateau. The first one is the Henry’s Fork Caldera which is located in Idaho and it was formed 1.3 million years ago. The Island Park Caldera is oval shaped and it is much larger. It extends very much into the Yellowstone National Park. The Yellowstone Caldera can also be found within the park but the only one to be visible currently is the Henry’s Fork Caldera. The Island Park Caldera is much older than Henry’s Fork and its dimensions are close to 80 by 65 km. That should give you an idea of how big a Yellowstone Volcano explosion could be. The Yellowstone Volcano has erupted in the past and it will erupt again. It has been calculated that this supervolcano erupts every 600,000 years with the last recorded eruption happening 640,000 years ago. Today there have been four recorded VEI8 eruptions recorded at Yellowstone, with the oldest taking place 2 million years ago and the most recent one 640,000 years ago. Where Will The Eruption Take Place? The massive size of the Yellowstone Volcano means that there are different areas where the next eruption could take place. More than likely an eruption of the Yellowstone Volcano would be centered in a parallel fault zone out of three possibilities. The two areas with the largest flow of lava are always a possibility but in recent years a third area has been displaying frequent tremors. Because scientists know these areas they can monitor them closely. While the massive eruptions don’t take place often, small ones do take place a lot more frequently but they are not of the explosive kind. What Happens When The Yellowstone Volcano Erupts? The Yellowstone Volcano is known to be a supervolcano because in the past (2 million years ago) it released over 600 cubic miles of lava and ash in one single event. When the last eruption took place about 640,000 years ago it is believed that it caused the last ice age. The reason the ice age took place after the eruption is that the ash went up to the atmosphere blocking a lot of the heat the planet receives from the sun. That led to many species dying because vegetation could not survive and therefore animals had no food. Another supervolcano explosion which happened in Indonesia about 74,000 years ago is believed to have killed close to 60% of the human population. If the Yellowstone Volcano were to erupt today the consequences could be even greater than the Sumatra supervolcano which killed close to 60% of the population. The number of people in the world is a little over 7 billion already and if an ice age were triggered and animals and vegetation were to die then even fewer people would be able to survive. Food shortages would take place almost immediately and they would affect people even on the other side of the world. Those who live in the nearby area, especially those in Wyoming and the surrounding states, would stand no chance. The lava would kill most of the people in the area and those unlikely survivors would asphyxiate when they breathe in the ash. 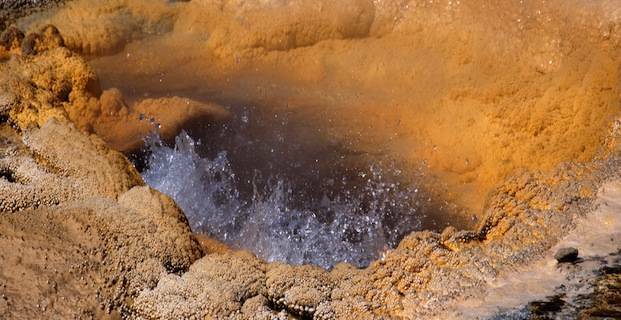 In other words, a Yellowstone Volcano eruption could mean the extinction of life on the planet. Despite the fact that some believe that an eruption at Yellowstone is overdue the chances of seeing an eruption on any given day are very small. Those chances have been calculated to be less than 1 in 10,000 of it happening in a given year and that is including the smaller eruptions. That is not to say that an eruption will not take place sometime; eventually the volcano in Yellowstone will erupt. Today magma is accumulating and tremors can be felt on the ground at Yellowstone. This serves as a constant reminder that this supervolcano could go off at any time.